Whether you are more of a lone wolf or part of the pack, one thing is for sure you want to win some gold! 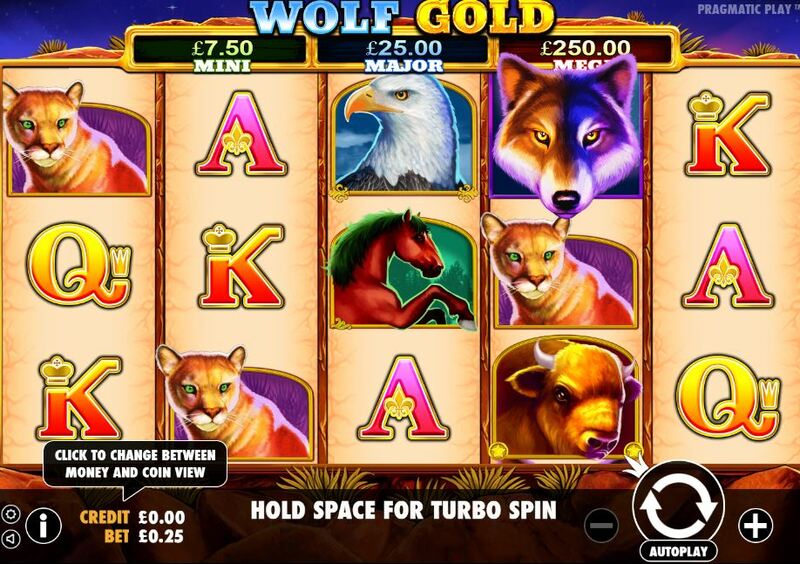 Wolf Gold is a fantastic release from the creative designers at Pragmatic Play and if you enjoy an animal-themed video slot then you are sure to love this. Packed with exciting bonus rounds as well as an RTP of 96% you could be leaving the desert with a massive jackpot prize over 500 times your original wager. So why not take on the wolf yourself and see how much you could walk away with. The designers have created a beautiful slot that is set in a desert filled with geological formations and lush green plants. It is approaching twilight and the sky is a stunning purple hue that really stands out against the golden reels. You will notice on the reels a selection of desert-dwelling animals that accompany the wolf such as the soaring eagle, wild buffalo, prowling wildcat and the magnificent horse. Each of these symbols comes with a multiplier which can be located in the paytable at the bottom of the base game screen. In here, you will find information about winning combinations as well as the bonus features. The lower value symbols of the game are represented by the playing card values J, Q, K and A which each will provide you with a payout of 50 times your wager and with a total of 25 paylines there are plenty of opportunities to pick up some nice wins no matter what symbols you land. The game is also accompanied by a mysterious and relaxed soundtrack that complements the setting well and provides a more immersive experience. However, if you prefer to play without sound you can always turn this feature off. Playing could not be easier, and with everything that you need located on the screen, the hardest decision you will have is what to bet. The value of your stake is controlled using the – and + buttons and bets start off at an inexpensive £0.25 increasing all the way up to £125, great for all of the high-stakes players among you. There is also a handy autoplay function that allows you to customise the number of spins you want to play for some uninterrupted fun or you can increase the pace (and the thrill) even more and use the turbo spins for a truly wild experience. Pragmatic Play has added some excellent bonus features to keep you engaged and to boost your bankroll that little bit further. Free spins are activated when you get three or more of the scatter symbols on reels 1, 3 and 5. The scatter symbol is represented by the rock formation and when you trigger this you will instantly be given five free spins. If you also get more scatter features during this round, you will unlock more free spins. The other bonus round is Money Re-spin which is activated by the moon symbol. The reels will be transformed and cleared of all other symbols giving you the opportunity to spin again to land some of the higher values symbols.